← Update 1609 for Configuration Manager Technical Preview – Available Now! What are ‘EXPRESS INSTALLATION FILES’ in WSUS? Actually, the idea is quite simple. The implementation exists since WSUS 3.0, though the application is not well known (anyhow I rarely see it in production at my clients). 1. To be sure that all our machines have the same level of updates while centralizing approvals and rejections. 2. It limits the use of the bandwidth WAN (internet link) downloading only once each update from the Internet. But what if it becomes a problem, or what if we’d wish to optimize (read minimize) the use of the LAN bandwidth? 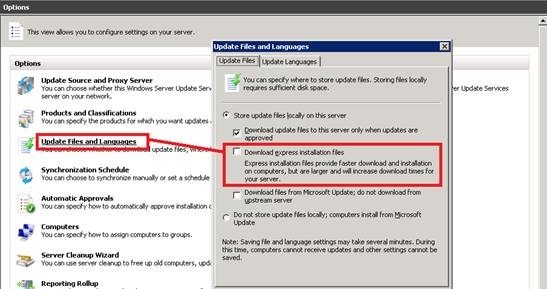 In fact, the use of ‘Express installation files’ is an option that allows the download of an update that doesn’t come in a package (a KB for all systems and all settings), it allows you to retrieve all the individual files that are in the update, the KB, with the precise description of each ‘how-to use’ downloaded file. The express installation files make it possible to get away from those two problems, extending the life of the hard disks, but also giving you a better quality service of your LAN network by only using it at its minimal. It quickens the massive waves of updates in your network. So, why Microsoft doesn’t activate this feature by default?… it’s only a matter of WSUS savings[rtdj2] : downloading unzipped files rather than KB compressed files, has two major drawbacks: first, the volume of your WAN (Internet) consumption is going to increase in a major way, but this increase also applies to your local storage space, on your WSUS server. If a KB destination is (7/8/8.1/10/2008/2008R2/2012 & 2012R2) in 32 and in 64 Bits would weight 100Mb compressed, then it wouldn’t be surprising that the same files, unzipped and with their detailed manifesto would weight 3 times more (300Mb), and here, we are only considering 1 KB. Then, when deploying this same KB on W10 machines, only the usefull 30 Mb are send on the machines, which lowers considerably the LAN traffic: 70 Mb by machine! Cet article, publié dans Deployment, ENGLISH, Formation, Security, WSUS, est tagué express installation files, WSUS. Ajoutez ce permalien à vos favoris.